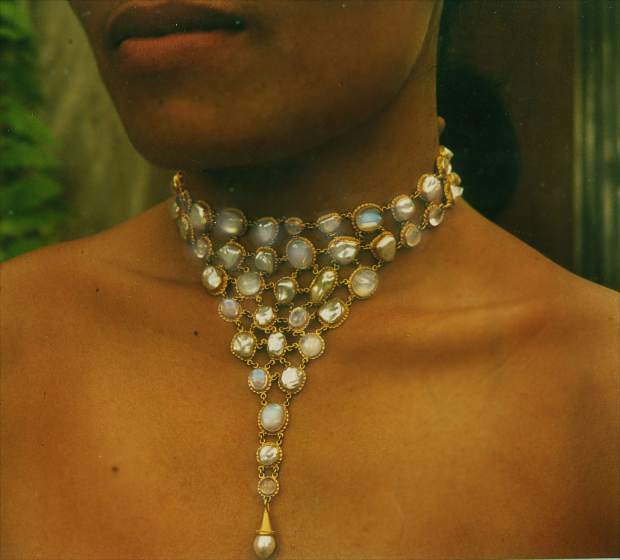 In 1999, actor Kurt Russell commissioned Carolyn Tyler to create this 22-karat gold, bib-style choker and detachable âhandletâ of white pearls and moonstones as a âgift for the new millenniumâ for actress Goldie Hawn. What: Jewelry designer Carolyn Tyler. When: Thursday, Dec. 29, through New Year’s Day; gallery is open daily from 10 a.m. to 9:30 p.m.
Where: Karats Vail, 122 E. Meadow Drive, Vail Village. Cost: Admission is free; jewelry available for purchase. VAIL — It’s no wonder the jewelry creations of renowned designer Carolyn Tyler are perfect for wearing on the world’s most celebrated occasion — New Year’s Eve — with its emphasis on romance, indulgence and sparkle. Tyler is showcasing her latest creations today through Sunday at Karats, a gallery in Vail Village. She said one of her most celebrated works is a necklace commissioned by actor Kurt Russell for actress Goldie Hawn in 1999. It was the perfect commission for Tyler, who has based her operations in Bali, Indonesia, since 1993. The resulting design is a 22-karat gold, bib-style choker of white pearls and moonstones linked together and ending in a long point. Tyler made the sides of the necklace detachable, so the triangular front could double as an Indian-inspired “handlet” that attaches to a pearl ring. For her personal appearance at Karats, Tyler is bringing a collar necklace she calls “Ancient Treasures,” which took four months to complete. The real treasure in Tyler’s work, she said, is the Balinese handcraftsmanship, which is at risk of extinction because many master goldsmiths’ children are eschewing this age-old tradition in favor of tourist-related careers. Tyler has the distinction of being the first artist Karats owner Dan Telleen chose to represent alongside his own bespoke designs in his working studio and gallery.